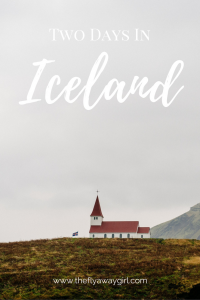 Iceland – the land of ice and fire – is an incredibly beautiful country and has been steadily gaining popularity over the past few years (no doubt helped a fair amount by its use as a location for filming in Game of Thrones). With thundering waterfalls, scenic national parks and magical geothermal spas, Iceland is a not-to-be-missed destination and with IcelandAir and WowAir opening up new routes and providing amazing stopover opportunities, the small Nordic island is now easier (and cheaper) to visit – even if you only get 48 hours in Iceland! Iceland is a small island located in the North Atlantic and the capital is Reykjavík, situated on the western coast, the northernmost capital in the world. With a population of only around 330,000, they are one of the most sparsely populated countries – with a population density of just over 3 people per square kilometre they have, along with Australia, Namibia, Western Sahara, Mongolia and Greenland, the lowest population density in the world. They are part of the EEA (not the EU) and Schengen Area, and they DON’T use the Euro. Their currency is the Icelandic kronur (ISK), and €1 is approximately 126 kronur (£1 = 139 ISK, $1 = 108 ISK), as of Sept 2018. Most staff in restaurants/bars/hotels/stores tend to speak very good English, but it’s always handy to have a few phrases at hand! I found that locals are always pleasantly surprised if you know a few words. 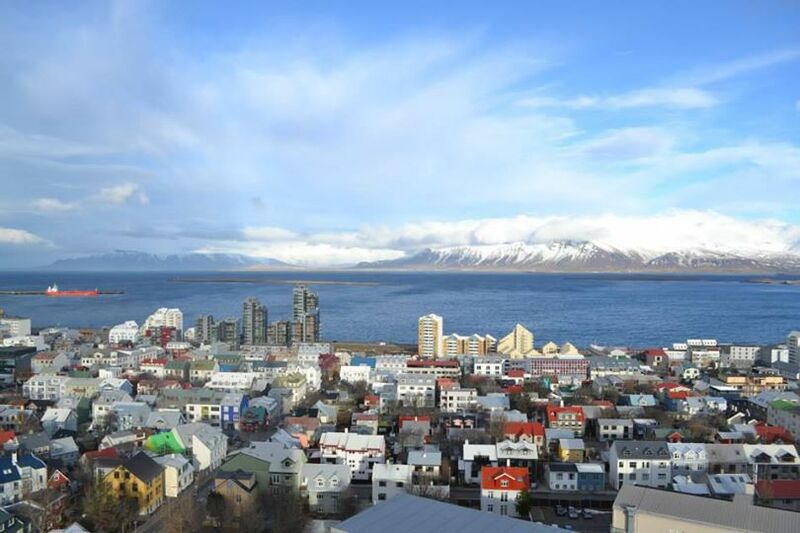 Iceland is becoming more and more accessible thanks to the national carrier, IcelandAir, and budget carrier, WowAir, opening more and more international routes departing from and going to Reykjavík. 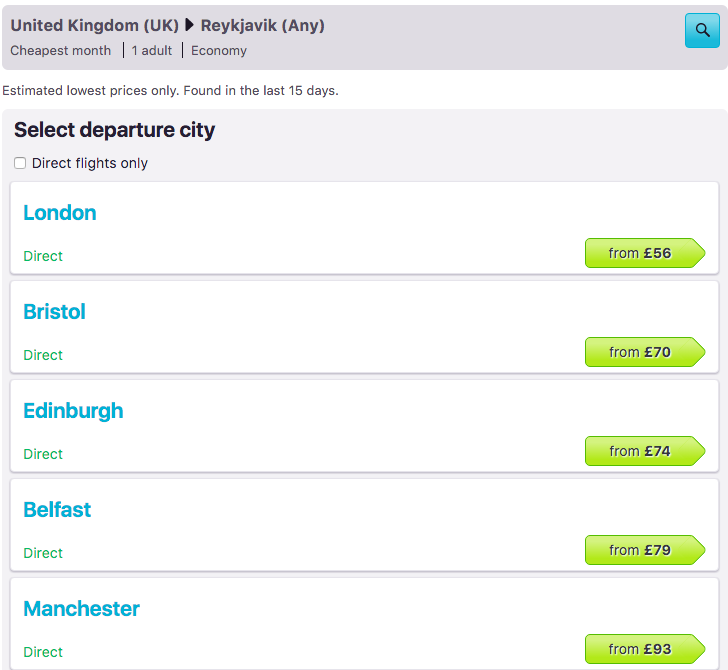 A few other airlines also serve Reykjavík, but these are limited: Delta Airlines (to and from JFK), EasyJet (to and from UK airports – London Luton, London Gatwick, Bristol, Belfast, Manchester, Edinburgh; to and from Basel, Mulhouse-Freiburg and Geneva), Norwegian, GermanWings (to and from Cologne), SAS (to and from Oslo), AirBerlin (to and from a variety of German airports, plus some others) and Austrian Airlines (to and from Vienna). There are also domestic flights throughout Iceland, as well as flights to Greenland and the Faroe Islands. It is also possible to travel by ferry from Denmark, although this is a weekly service and it takes two nights. It goes via the Faroe Islands and goes to Seyðisfjörður on the east coast. I have flown with both WowAir and IcelandAir and they were both great experiences. I flew to New York with IcelandAir and that was when (on my return) I spent 48h in Iceland as my stopover. Have you flown to Iceland or within Iceland? Have you gone by ferry? Tell us in the comments! Reykjavík is really quite small and is easy to walk around, although some sights are a little further out and it is therefore easier to go by bus. 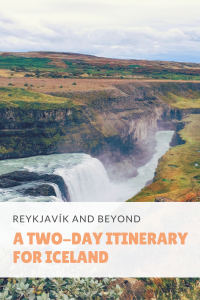 I will cover more about getting around the capital in Day 2 – a day in Reykjavík! 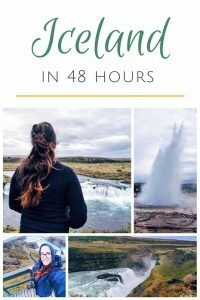 For this 48 hours in Iceland itinerary, there is more than enough to keep you occupied! 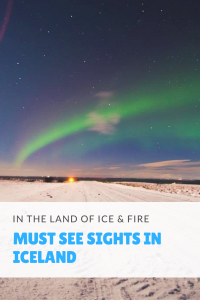 In this article I will only cover taking tours (where you will be shuttled to each different place by coach) as I feel that this is much easier when only in Iceland for a short period of time! 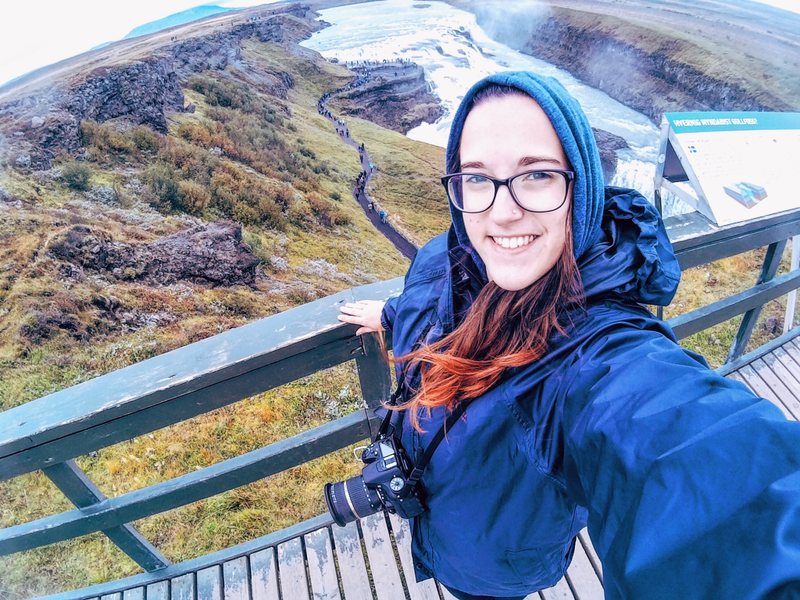 However, if you are spending slightly longer in the land of ice and fire, you are better off getting a rental car like Michaela did (and check out this incredible 50 stop road trip of Iceland! ), touring by bike (ONLY if experienced in this area!) or hitchhiking. You can also travel by plane within Iceland, for example to Akureyri and Husavík in the north or Seyðisfjörður in the east. There are also long-distance buses serving a large amount of Iceland, but these are often just as expensive (or more so) than flights. BSI is the bus station in Reykjavík (not to be confused with the Gray Line bus terminal, which is only for Gray Line tours!) and you can catch a variety of buses from here, such as to Akureyri, Seyðisfjörður and Reykjanesbær. There is luggage storage (1,000 ISK per item per day or 1,500 ISK for ‘odd shaped items’ such as bikes or skis) and a lovely café – if you do eat there, get the meat stew (around 1,590 ISK including soup, self-serve salad, soda and coffee) as it is absolutely delicious, super filling and great value for money (approx £11). 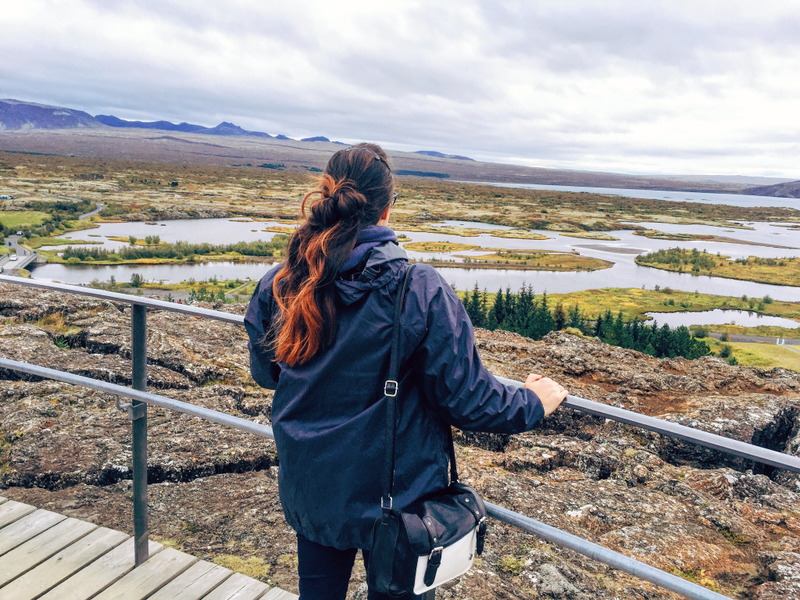 For your first day, I recommend a tour and the tour that I recommend is the full Golden Circle tour. Yes, it’s touristy. Yes, it’s a classic, but YES it is worth it! We did the Golden Circle Classic tour with Gray Line Iceland and our guide, Ástþór, was absolutely amazing. Þingvellir (pronounced ‘Thing-vet-lihr’) National Park is a UNESCO World Heritage Site located in south Island. Here you will find the longest running parliament in the world (established in 930 AD) and amazing landscapes due to it being located on the border between the Eurasian and North American tectonic plates. After large numbers of settlers began to arrive in Iceland in the 9th and 10th centuries, a seat of ‘government’ was established here, in Þingvellir. In 1662 Iceland swore allegiance to the King of Denmark and the government/council at Þingvellir was used only in a judicial form and Þingvellir itself was the site of many executions. It then became a symbol of national unity and independence during the struggle for independence and it was used as a seat of government in some form until the late 18th century, when the main government moved to Reykjavík. 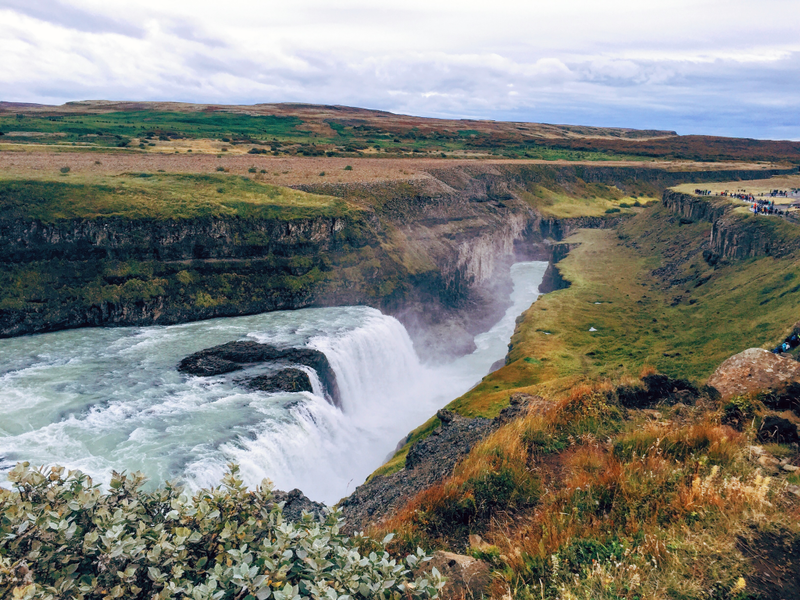 Gullfoss, or ‘golden waterfall’ is an incredible 32m high double waterfall on the south coast, about a ten-minute drive from nearby Geysir. In the summer, due to heavy rain and glacial runoff, it is the largest volume waterfall in Europe! It is truly magnificent for photos and just generally for watching and admiring the power of nature. There are lots of people but you can find a few spots away from the crowds. DO NOT cross any barriers (they are mostly just cordoned off with rope but we saw one idiot someone almost fall while having their photo taken right on the edge after climbing over the barrier. However, I like to think of this as Darwinian evolution, AKA survival of the fittest. Or most intelligent. The café at Gullfoss is excellent, albeit pricey (but this IS Iceland and a very touristy spot), and I definitely recommend the lamb soup. Don’t forget to take warm clothing, especially a windbreaker! It can get pretty breezy up here as it is fairly flat and, in certain places, there is a fair amount of spray coming off the falls. The temperature of the water in the eruptions is around 125 ºC and water in the streams and in inactive geysers can be around 80 – 100 ºC, so don’t go testing the temperature unless you’re a huge fan of second-degree burns (you really shouldn’t be). The Geysir field is an amazing place to observe the incredible natural phenomena and Icelanders are extremely proud of it. Barriers are minimal which provide for great photo opportunities and excellent viewing, but if you are with small children or idiots like the guy who almost fell into the waterfall, please take care and make sure you keep an eye on them (or hold their hand) at all times! Faxi, aka Vatnsleysufoss (you can see why it’s referred to as Faxi), is a gorgeous smaller waterfall along the Golden Circle route. Located on the Tungufljót river, it is a popular fishing spot due to an abundance of salmon. If you are self-touring Iceland, there is a well-recommended restaurant called Vid Faxa next to the fall. It is located in an area with the incredible name of Bláskógabyggð, which I challenge you to try to pronounce. I’m totally kidding, you won’t manage it. Unless you’re Icelandic, then that’s cheating. *not included in all itineraries, we only visited as we had extra time after Þingvellir. Skálholt is incredibly important in the history of Iceland as it was the spiritual centre of the country from around 1000 AD, when Christianity was made the de jure religion of the island. It remained so for approximately 700 years, until someone had the bright idea of moving it (the spiritual centre, not the region or church) to the capital city. In the 17th century a wooden church, larger than the current 20th-century structure, was built at Skálholt, although the medieval church was the largest ever built on the site. The modern cathedral you now see was inaugurated in 1963. 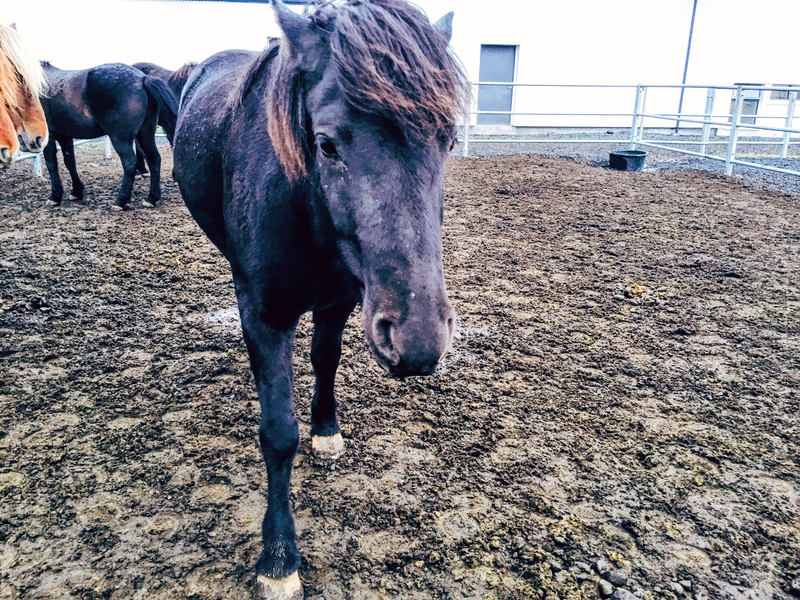 Fákasel Horse Park is an amazing place where you can meet the gorgeous Icelandic horses (do NOT refer to them as ponies), eat amazing food and you can also ride the horses here if you wish. Unfortunately, it was raining when we visited and so the usually friendly and curious horses were looking a little miffed at being outside in the rain. Looking for an even more intensive tour? Head off on the 10 hour South Iceland tour and see spectacular waterfalls, impressive volcanoes and an enchanting black sand beach. Have you done the Golden Circle tour? Tell me in the comments! Café Loki is a must-visit when coming to Iceland! I have been here twice now and the food is still great (and in some places… interesting). With items on the menu ranging from mashed fish on rye bread and smoked lamb on flatbread to fermented shark and ram’s testicles, there will be something for everyone (including a very pleasant lamb soup). Well, unless you’re vegan. Then potentially not. I recommend having the Icelandic Plate II followed by the amazing Skyr (a type of yoghurt) and caramel sauce pancakes. Loki also offers an intriguing rye bread ice cream, and don’t forget to try Brennivín (an Icelandic schnapps), also referred to as ‘the Black Death’! A four-floor bookshop with a lovely café on the top floor serving delicious coffee and a good variety of loose leaf teas as well as some impressive cakes (definitely recommended). An excellent place to grab some amazing Icelandic crime novels (an incredible new addition to the dark Nordic crime genre). My favourite author is Yrsa Sigurðardóttir if you need a starting point! 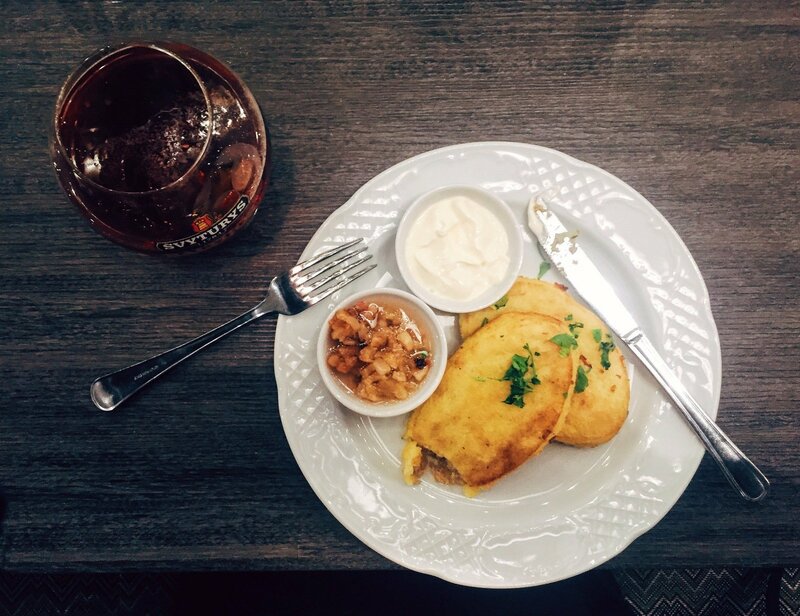 For more great coffee in Reykjavík, check out Crystal’s round up of her favourite coffee shops! 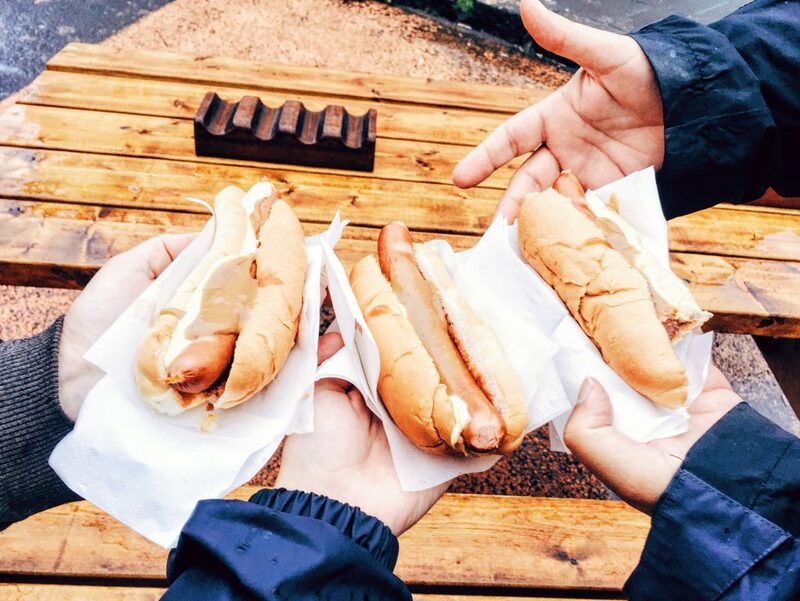 With a name that literally translates to “town’s best hotdogs”, you know you’re in for a treat. It is now a chain that has been in continuous operation since 1937 and, rain or shine, there will be a queue for these delicious (and cheap) hotdogs. Request one ‘with everything’ (fried onions, sauerkraut, mustard, mayonnaise and ketchup) and you’ll be very content. At 420 ISK (less than £3) they are also a great budget option! Now it’s time for a pleasant drink and Micro Bar is a great place to go to get your fix of excellent Icelandic beer. You can get a ‘taster tray’ of five or ten beers from Icelandic micro-breweries at 1,800 ISK for five or 2,800 for ten. The ‘tasters’ are approximately 125ml each and are a great way of trying out a variety of Icelandic brews. Just mind that it’s tucked away in a corner of Vesturgata and is easily missed if you are careful! You can find details, plus lots of photos, of the Icelandic beer we tried over at my dad’s Instagram. Hallgrímskirkja, or ‘church of Hallgrímur’, is the largest church in Iceland at 74.5m tall. 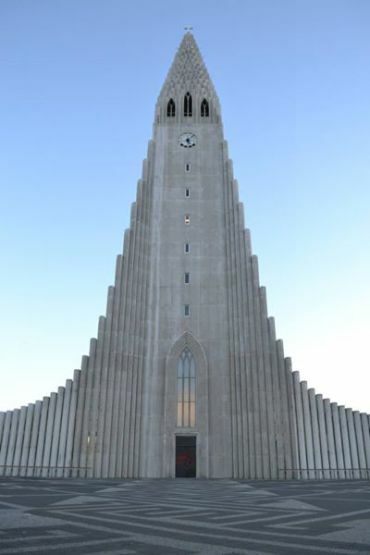 The church is named for Icelandic poet and clergyman, Hallgrímur Pétursson and was designed by architect Guðjón Samúelsson in 1937, with the design to resemble the basalt lava flows in Iceland’s landscape. It was a controversial design at the time and took 41 years to build, being finished in 1986, and Samúelsson never saw his design come to life. It is one of Reykjavík’s best-known landmarks and is visible through the city. The church is free to enter, but if you wish to take the lift up the tower to the observation deck there is a charge of 900 ISK (around £6). 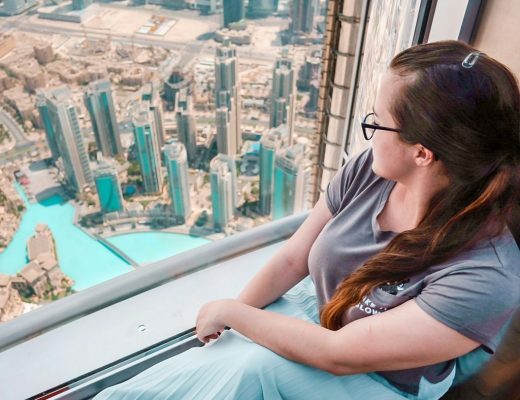 On a clear day the views are incredible, especially around sunset! The tower is open in the summer months 9am – 9pm and in the winter months 9am – 5pm. This building previously housed the National Library and has been home to a variety of different museums throughout the years. Since 2015 there has been a permanent exhibit called ‘Points of View’, which is based around the visual history of Iceland, showing different depictions of things like religion and volcanic eruptions. An incredibly interesting museum and only 700 ISK for adults, except on Wednesdays when it is free. The National Museum costs 1500 ISK (around £10) for adults, 750 ISK for students and senior citizens and is free for under 18s. It is the oldest museum in Iceland at 153 years old and has incredible exhibitions around the history of the nation, from the Settlement to present day. The museum is closed on Mondays and is open in the winter months 11am – 5pm and in the summer months 10am – 5pm. 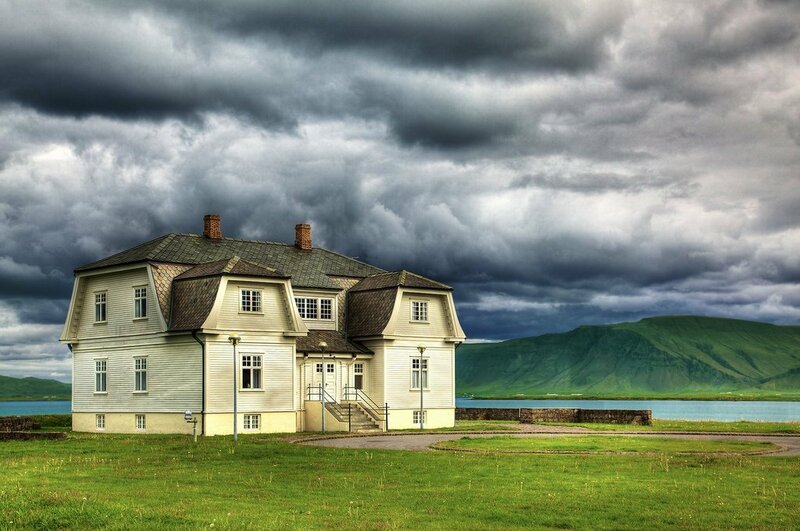 Höfði (pronounced ‘Hoef-dhi’) House is best known as being the location for the 1986 Reykjavík Summit meeting of presidents Ronald Reagan (USA) and Mikhail Gorbachev (USSR), which was effectively a step to ending the Cold War. 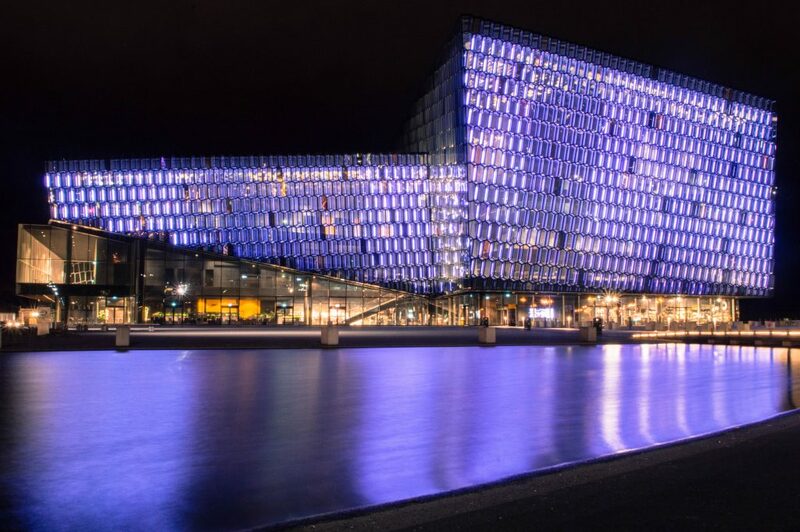 Harpa is home to the Icelandic Symphony Orchestra and, aside from incredible performances, also houses some incredible photography exhibitions that seem to be ever changing! The architecture is also very interesting and it’s a great place to escape the wind/rain/snow (or all of them) for a little while. Free to enter. You can also sometimes observe open rehearsals for only 1900 ISK! Tickets for performances (plus comedy shows and more) can range from around 2,500 to 7,500 ISK. Tickets available at harpa.is. When I organised a week in Iceland for my university photographic society, we stayed at Hlemmur Square. I definitely recommend it for both the hostel and hotel. Hotel rooms range from 19,000 ISK to 42,000 ISK per night and hostel beds from 2,800 ISK to 5,400 ISK per night depending on room size/season. Airbnb is a great choice in Iceland and we stayed in a lovely one bedroom flat only five minutes from the centre of Reykjavík and were hosted by the lovely Hekla. It’s often a cheaper choice but do check how far out of the city centre the house/flat is! Click here for £25 off your first Airbnb booking! New customers only. 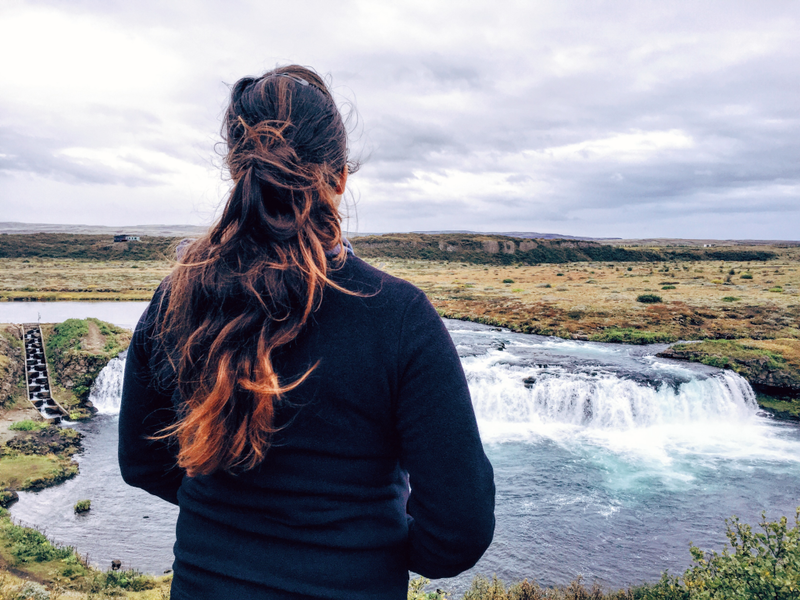 For more suggestions on things to see and do when travelling Iceland on a budget, check out Global Brunch’s article 15 Tips to Help You Explore Iceland For Less! Cheeky selfie at Gullfoss with my snazzy new SJ4000 action cam! Have you been to Iceland? Where do you recommend to sleep, eat and adventure? 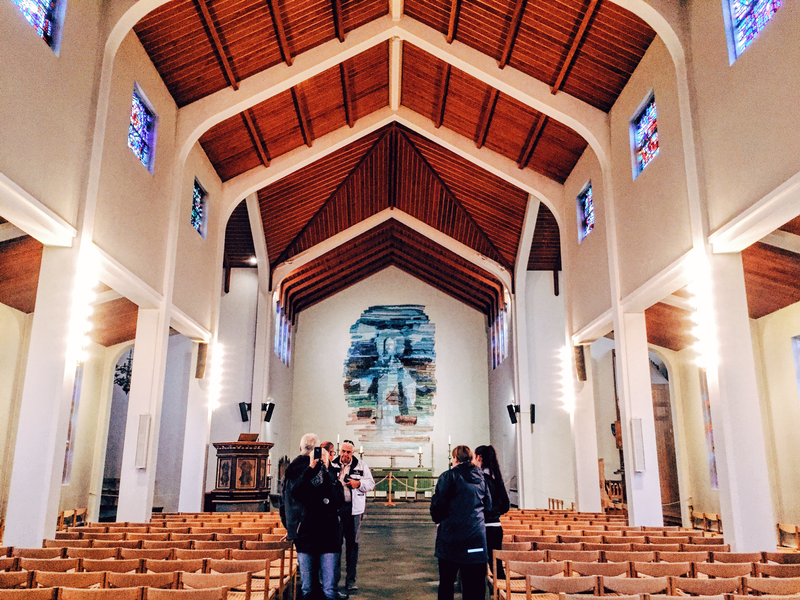 What should a traveller not miss in Reykjavík? Tell us in the comments! Don’t forget to share on Pinterest/Facebook/Twitter!